California's toughest prison remains under a lockdown after a deadly race riot. Guards opened fire on rioting inmates at Pelican Bay State Prison on Wednesday, killing one prisoner and wounding 8 others. CBS News Correspondent John Blackstone reports the half-hour melee at Pelican Bay State Prison in Crescent City involved about 200 inmates using handmade weapons. "There were numerous inmates that were injured as a result of inmate on inmate fighting - numerous stabs and other kinds of injuries associated with this kind of fighting," said Bob Martinez of the California Department of Corrections. Don Novi, president of the California Correctional Peace Officers Association, called the disturbance a race riot. "The African American inmates and the southern Mexican inmates went at each other," Novi said. "They got this thought now that they can do anything and without being shot." The maximum-security prison was built for 2,280 inmates but has 3,400, many of whom were sent there after being involved in violence or escape attempts at other prisons. About 1,200 of the inmates are in permanent lockdown conditions. Prison spokesperson Lt. Ben Grundy did not know what sparked the violence, although he noted, "We've had racial incidents in the past." The eight prisoners wounded by guards were taken to hospitals, and one was in critical condition, said Grundy, who would not give details on the others' conditions. 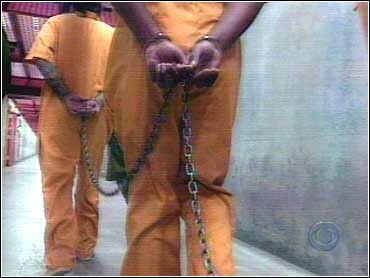 Local news reports said that 19 inmates suffered injuries related to the melee, such as stabbings and beatings. No guards were hurt. The fighting started in the exercise yard of the highest security wing of the maximum-security prison. Inmates stabbed each other while guards used tear gas and pepper spray to try to control them before they began firing, Grundy said. The prison, located in northwest California prison 20 miles from the Oregon border, contains a general population prison, a special area for violent offenders and a 200-bed minimum custody unit. Grudy said the violence "definitely would be one of the worst, if not the worst" riot in the history of the prison. Guards were able to put down a riot last August by firing tear gas and rubber bullets. A guard underwent surgery for a fractured cheekbone, but no inmates were seriously hurt in that disturbance. In 1997, six inmates were killed, all in clashes between cellmates at the prison. Novi said, "These are people that don't get along with their fellow human beings period. And anytime they come out they want to kill someone, they want to hurt someone." Mass murderer Charles Manson was moved to Pelican Bay in 1997 after authorities said they caught him dealing drugs at Corcoran State Prison. A few members of the staff at Pelican Bay have gained a notoriety of their own. Former Pelican Bay guard David E. Lewis was convicted of civil rights charges Feb. 14 for shooting a prisone after a fight in 1994. Also, two former prison guards were indicted Wednesday for violating the civil rights of Pelican Bay inmates. E. Michael Powers and Jose Ramon Garcia are accused of conspiring to arrange assaults on prisoners, one of them fatal, over a nearly three-year period. In 1995, a federal district court judge ruled that conditions at Pelican Bay caused "senseless suffering and sometimes wretched misery." The inmates involved in that 1995 case included Vaughn Dortch, an inmate who suffered second- and third-degree burns over half his body from a bath in the prison infirmary and won $997,000 from the state in a separate case.